Another bun moment . I have my mixer replaced. Is such a shame when the mixer broke down after I make this bun . It was a gift for my last year present, apparent the model is not that powerful to handle bread dough . The mixer died half way of my making. Thank GOD, I have another old old "Kenxxxx" brand mixer to help me to finish off this bread . Since it was within the warranty period, we can get another replace. However understanding the model was not suppose to knead heavy dough I upgrade it to another higher version. Come back to this lovely recipe ->Christine's Recipes. I love all her baking and cooking. The picture is neat and the instruction is very clear. Some of it come with a step to step picture and you will not missed it. The result is always good and yum.From her blog I leanrt a lot of different method of TangZhong. I am not too fuss on the name but I do know there will give variety of result , one just need to know what is your preferences. So here is the result of this “65°C湯種麵包” by Yvonne Chen 陳郁芬. 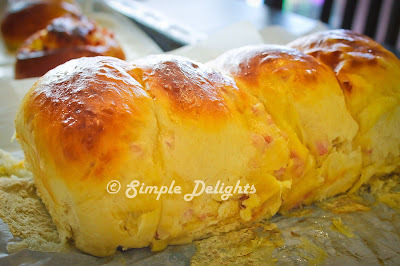 I will leave with you to read on her blog where she explain the TangZhong and how to mix in variety of different bread. 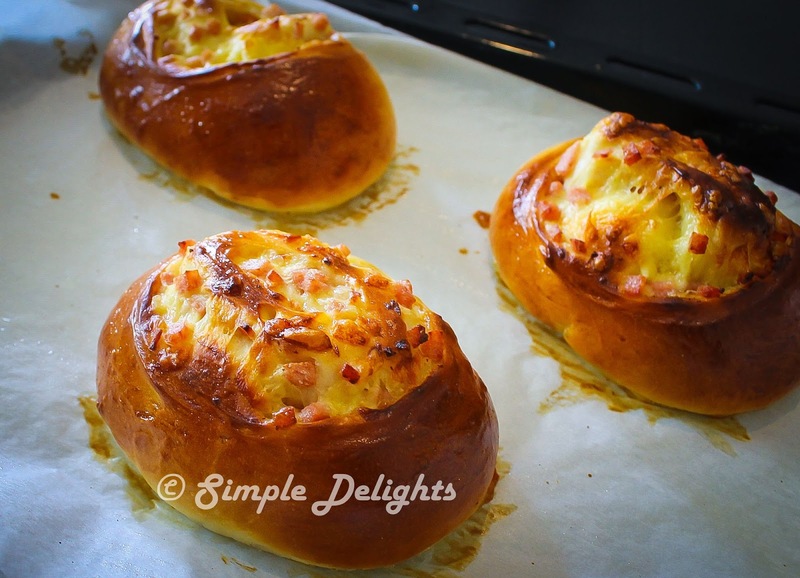 I used her recipe to do this Bacon and Cheese Bun. 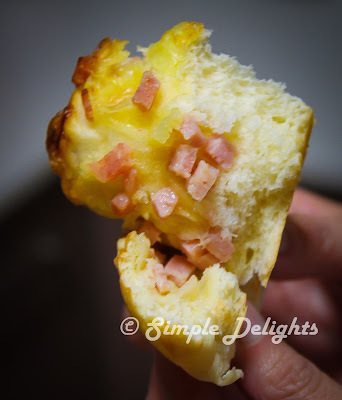 Of course sharing is loving , so this bread has been share with my love friends and they all enjoy it as breakkie. 1. Mix flour in water well until no lumps. Place in a sauce pan cook over medium-low heat, stirring consistently with a whisk to prevent from burning and sticking while cooking. 2. The mixture will eventually become thicker and thicker . Once some lines appear in the mixture for every stroke you make with the whisk, the tangzhong is done. 3. Remove from heat and transfer to a clean bowl. Cover with cling wrap sticking onto the surface of tangzhong to prevent for drying up. Let it cool , this can be used straight away once it cool down to room temperature. I cooked this one night before and stored in the fridge , the next day while preparing my bread I have this took out from the fridge and let it get back to room temperature before using. 1. Place all the wet ingredient in the mixing bowl including the tangzhong except the butter. 2. Put in all the dry ingredient Bread flour, sugar, salt , milk powder ( if you used it ) in the wet ingredients. Make a well in the dry ingredient and have the instant yeast place in. And start to knead the dough with a dough mixer. Start off with lower power till all ingredient well combine it might take about 10mins. 3. Once the dough is in dough shape and gluten has developed, put in the butter for continue kneading. At this stage the power of the mixer can be increase and combine to knead till the dough is smooth and when you stretch the dough it will forms a thing "membrane" or pass through the window pane test. 7. 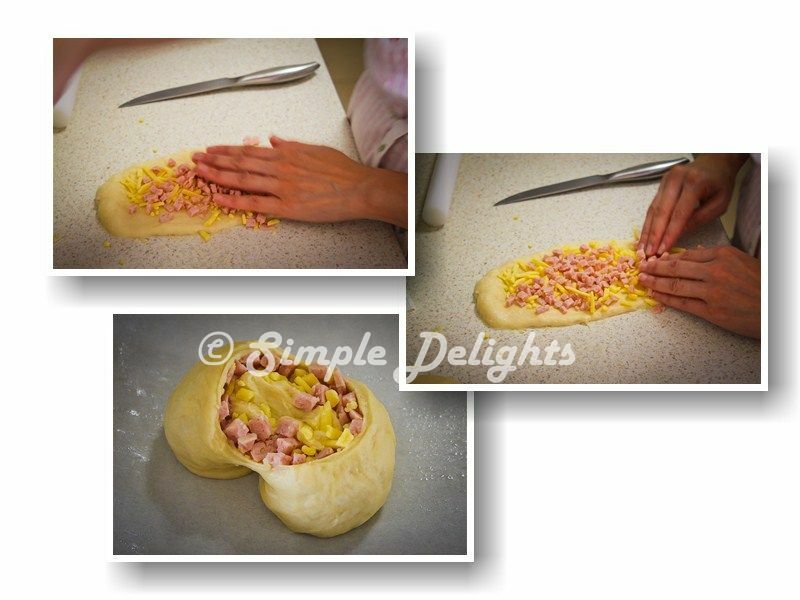 Arrange the rolled-up dough in a greased/ line on baking paper. Leave it for 2nd round of proofing , it takes about 40-45 min, until the dough rises up to 75% of the original size. 8. Preheat oven to 175C. Brush the surface of the bread with egg wash. Bake in the oven for 30-40min. It depend on the shape of the bread you making , if you put the bread in the tin it will take longer time. 9. Once is done, transfer the freshly bake to wire rack and let it cool completely. We have the bread while it still warm , is hard to resist the smell of bread when is warm and the aroma is full in your house. The reminding can be kept in airtight container.